Benedictine monks arrived at Westminster in c. 960, but the building complex seen today dates primarily from the thirteenth century, when King Henry III began rebuilding the abbey church in the new Gothic style of architecture. By 1269 the choir and eastern portions were completed and the body of King Edward the Confessor (d. 1065) had been transferred to an elaborate new shrine, which drew many thousands of pilgrims each year. In 1300, King Edward I had a Coronation Chair made to enclose the Stone of Scone, which he had brought from Scotland in 1296; the Stone—symbol of Scotland’s submission to England—was returned to Scotland in 1996. All but two of England’s kings have been crowned in Westminster Abbey, and many (including Henry III, Edward I, Edward III, Richard II, and Henry V) are also buried there. Indeed, over 3000 people are buried in the Abbey. Among them is the great poet, Geoffrey Chaucer (d. 1400), who actually rented a property from the Abbey. About 30 to 60 monks lived at Westminster Abbey during the middle ages, and probably two or three times as many lay servants, almsmen (those allowed to live and eat there for free), and skilled craftsmen to help run the estate, such as masons and carpenters. The Abbot and the chief officers had private rooms, but the rank and file monks lived in a great dormitory (now divided into the Abbey Library and the Great Hall of Westminster School). The monks had access to a garden (which can still be visited) where they could take walks and grow herbs. Sick monks were cared for in the Infirmary, part of which is now the Little Cloister. The Abbey was situated in the town of Westminster, which was outside the walls of London to its west. Like most towns, it was governed by a small wealthy elite and social life was governed by parishes and guilds, but unlike most towns, it had two especially powerful residents: the king (who resided at Westminster Palace) and the wealthy Benedictine Abbey of Westminster. Parliament often met in Westminster: the Lords gathered at Westminster Palace and the House of Commons sometimes met in the Chapter House of Westminster Abbey. Almsgiving was an important part of the Benedictine way of life, and was especially significant at Westminster because so many royalty and nobility left large sums for the Abbey to distribute to the poor at their funeral and on the anniversary of their deaths on the assumption that the poor receiving alms (usually a penny or two) would pray for their souls. Other alms were leftovers from the monks' meals, distributed to the poor who gathered at the monastery’s gate. The ‘poor’ included pilgrims and other travelers, poor people who lived nearby in Westminster. Very large crowds could gather on occasions when alms were distributed. On the anniversary of the death of Queen Eleanor of Castile, it seems that at least 12,000 poor descended on the Abbey to collect a penny each (in this period, the daily wage of a common laborer was 3 pence and a large loaf of bread cost only ½ pence). Harvey, Barbara F. Living and Dying in England, 1100-1540 : The Monastic Experience. Oxford: Clarendon Press, 1993. Rosser, Gervase. Medieval Westminster 1200-1500. Oxford: Clarendon Press, 1989. 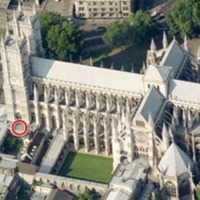 “Westminster Abbey,” Medieval London, accessed April 22, 2019, http://medievallondon.ace.fordham.edu/items/show/3.